Start getting ready for your trip to St. Petersburg by reading the latest information about the city, best places to dine&shop, and major places of attractions. Just a few cities in the world can offer such magnificent architecture, intriguing historical sites and unique imperial atmosphere as Saint Petersburg. Often called the City of Tsars, St. Petersburg is among the most beautiful travel destinations not only in Russia, but also in the world. Founded in 1703 by Peter the Great, the city of Saint Petersburg has rather short but intense history characterized with revolutions and wars, as well as other major events that took place in the country. Today, Saint Petersburg nicely combines the richness of the Russian heritage with a distinct European outlook and atmosphere. Besides being a major port on the Baltic Sea, St. Petersburg is considered by many travelers to be the cultural capital of the country. St. Petersburg has population of over five million citizens. Locals are very proud they were born here and often call the city just “Peter” as if addressing to a close and dear friend. The people of St. Petersburg know well the glorious past of their city and thus they show high self-esteem and pride. Many famous musicians and talented artists, scientists, writers and poets were born here and took the opportunities that life and the city gave them to create their masterpieces. Life in St. Petersburg is very interesting and dynamic, subordinated to the rich culture and traditions, the fascinating history, the marvelous architecture and art. The endless ballet, theater and opera productions, the exciting nightlife further charm the travelers. Welcome to the city of grandeur and White Nights - St. Petersburg! St. Petersburg is the most northern city on the globe, positioned on the Baltic Sea eastern shore. It is the second largest city in Russia and is divided into 20 districts and several satellite towns. St. Petersburg is served by Pulkovo Airport, with Terminal 1 covering the domestic flights and Terminal 2 handling the international flights. There is also a sea port with a terminal for passengers on Vasilievsky Island. The city could also be reached through the small airport of Lappeenranta in Finland, set near the border with Russia, usually used by the budget airlines. Only few cities in the world can offer so many appealing attractions as St. Petersburg, the city in Russia that is mostly associated with its glorious past. Its vast squares, winding canals, grand palaces, museums and art galleries and its notable parks should be all seen and enjoyed. Located at the Winter Palace, the Hermitage Museum is a prime attraction in St. Petersburg. Its collection of art could not be rivaled by any other museum or art gallery in the world. The imposing setting of the Hermitage is a great introduction to the paintings and sculptures of such great artists as Leonardo and Rembrandt, Michelangelo and Rubens, etc. Tickets could be bought online to avoid the queues. Think about a tour guide as well, as you will get valuable information. The fortress is very appealing, with its interesting exhibitions and impressive church, where are buried all tsars of the Romanov dynasty, including Peter the Great himself. A visit to St. Petersburg would never be complete without attending a ballet or an opera performance at the Mariinsky. Buying tickets online is not a good option since they are much more expensive than at the theater. The Admiralty serves as Russian Navy headquarters and is famous for its central tower, 70 m gilt spire, façade of nautical sculptures and beautiful garden. Decemberist Square was once stage of an ill fate revolt, today this is the second largest square in St. Petersburg and a favorite place for meetings. This is the main shopping boulevard in St. Petersburg, where are positioned many charming boutiques and department stores. A small and appealing shopping center for the well-to-do people. The largest shopping center in St. Petersburg, which first opened doors in the middle of 18th century. Placed near Griboedova Canal and the Church of the Saviour, this is the place to go if you want to buy souvenirs. You will never be hungry at St. Petersburg, as it has many dining places from budget to elegant restaurants. Make sure to try a large cup of tea with hot Russian crepes – you can get them with mushrooms or caviar, berries or caramel. St. Petersburg city offers an impressive choice of pubs and bars. Baltica is produced here, the most popular Russian beer. The night clubs are of great selection as well, playing all kinds of music. This chain of bakeries serves fresh Russian pies and tea at a very reasonable price. Wonderful restaurant that needs reservation. Cozy atmosphere, tasty food and delicious desserts. Splendid club for budget drinks that serves original shots and is quite busy during the weekend nights. You can go on a boat trip along the channels and rivers, visit the Festival Scarlet Sails and stay up during the magical White Nights enjoying the numerous open-air events. The Neva bridges open two times per night – a view that should be seen. Go hiking in the nearby forests, visit the art galleries, and enjoy the start of the theatrical season. 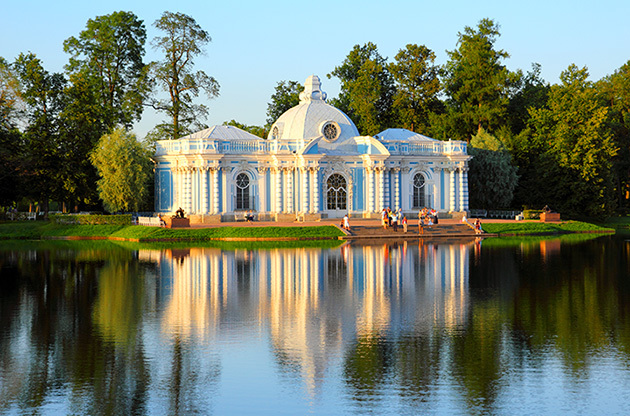 You can also go on a one-day trip to the park and museum Gatchina, the town of Novgorod, the Oreshel fortress, the Pushkin city, the green park of Pavlovsk, and the Peterhof Palace. Take a steam bath, go for skiing and skating at the St. Petersburg parks, treat yourself with a few vodka shots to warm up. Enjoy the sun and watch the parade for the St. Petersburg Day at the end of May. The city has more than 200 parks full of greenery, go for a walk! Always bring your identification with you. Watch out for pickpockets, especially on the public transport when crowded. Know that police can inspect you only at the police stations. If approached on the street, ask for the name of the officer and ones badge number. Change money only at the banks and count your change before you leave the shop. In St. Petersburg many international trade shows, exhibitions and fairs, congresses and seminars are held. The city provides wonderful venues and many elegant hotels .